Marshall's Wave is located on the North Fork of the Teton River, where the Teton River splits into the north and south forks. The wave is created by a headgate and is best at flows above 600 cfs. This wave is a little harder to get back in to once you drop out, so get in everything you can before you decide to drop it. It Takes a little work to get back up to the wave. 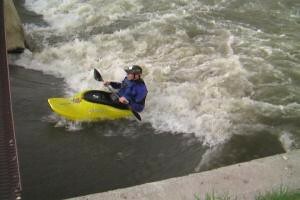 Kayaker playing in Marshall's Wave near Rexburg, Idaho.